'We Are Being Targeted': Voodoo Believers Fear Backlash - Integration Through Media ....! (VOA): Two separate crimes against children in recent days have one haunting similarity: authorities have pointed to Voodoo rituals as a possible motive. 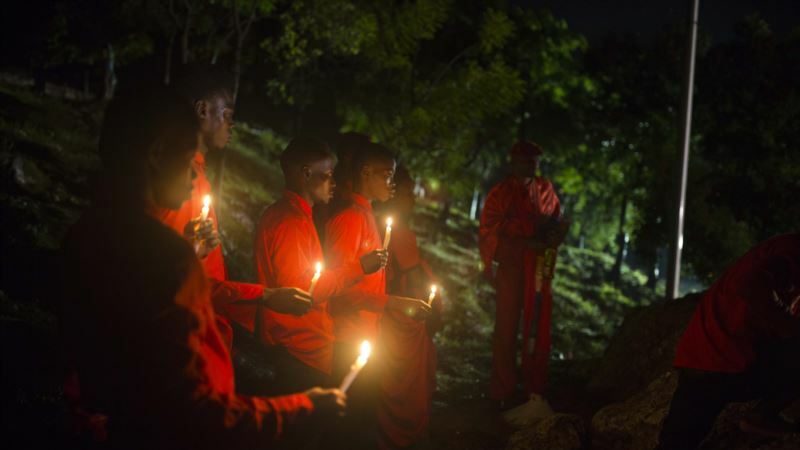 But practitioners of Haitian Vodou, which adherents spell differently to distinguish it from other variants, say the religion does not sanction violence and fear the crimes will spark a backlash against their community. "We are being targeted," said Maude Evans, a Haitian native and Vodou priestess in Boston's Mattapan neighborhood. "I'm really concerned that that's how it's going to be from now on. They will do things and blame it on Vodou." Two sisters in East Bridgewater were arrested last month after they tied down and burned a 5-year-old girl, permanently disfiguring her, in a "voodoo ritual" meant to rid her of a demon, authorities say. Peggy LaBossiere, who was arrested with her sister Rachel Hilaire, also is accused of threatening to cut off the head of the girl's 8-year-old brother with a machete. About a week later in nearby Brockton, officials said, a mother stabbed two of her children in what she described as a ritual involving "voodoo stuff," according to court documents. Days later, at a candlelight vigil that drew hundreds of mourners to the crime scene, a local Christian bishop denounced the practice of Voodoo, to cheers from the crowd. Voodoo refers to religious practices developed by Caribbean slaves who took spiritual traditions from their native Africa and merged them with elements of Christianity and other faiths. Adherents generally believe everything is infused with a spirit and that prayers and other devotional acts will help bring them good health and protection. But there has been a movement in recent years in Haiti to refer to the practices as Vodou, which means "spirit" or "deity," to set it apart from U.S. Deep South variants more commonly associated with occult objects like Voodoo dolls and talismans. The negative portrayal of Voodoo in American culture goes back at least to the Hollywood films of the 1920s and 1930s, said Patrick Bellegarde-Smith, a retired professor of African Studies at the University of Wisconsin-Milwaukee. In "White Zombie," a 1932 film that often is credited as the first feature-length zombie flick, Bela Lugosi played an evil Haitian voodoo master who commanded an army of zombies. Lunine Pierre-Jerome, a Randolph, Massachusetts, resident who was raised in a Haitian Vodou household and still practices privately, is adamant that what is being described as "voodoo" in these cases is not a reflection of her culture. "Some see us as worshiping the devil or evil spirits, but that's far from what it is," Pierre-Jerome, who teaches at Cambridge College in Boston and was a longtime administrator in the Boston public school system. Evans agreed: "We don't hurt children. It's about healing." The mother of the woman accused of killing her sons had voiced concerns to police about her daughter's mental health and said her daughter had become obsessed recently with a range of conspiracy theories, rituals and mythologies, The Brockton Enterprise reported . It is not clear whether the woman is a follower of Haitian Vodou, and her attorney did not respond to an email sent on Friday. The women accused of burning the child blew fire in her face and cut her on the arm and in the collar area with a needle-like object, police said. LaBossiere and Hilaire, who are of Haitian descent, said they had performed "cleansing baths" on the children but denied threatening or harming them, The Enterprise reported. Police said the girl's mother requested the ritual. The women have pleaded not guilty to mayhem, assault and other charges and are being held without bail. An attorney for LaBossiere declined to comment, and an attorney for Hilaire did not respond to a phone message on Friday. A spokeswoman for the Plymouth prosecutor's office, which is handling both cases, declined to comment. "Cleansing baths" designed to free someone from some sort of spiritual force are common in the various forms of the religion, said Jeffrey Anderson, a history professor at the University of Louisiana Monroe who has studied Louisiana Voodoo and Haitian Vodou. But Anderson said he is unaware of any ritual that involves the intentional burning of a child's face and speculated that the woman may have hurt the girl by accident. Animal sacrifices are also common in Vodou, but "only the devil may destroy people's life," Pierre-Jerome said. Elizabeth McAlister, a religion professor at Wesleyan University in Middletown, Connecticut, who specializes in Haitian Vodou and other Afro-Caribbean faiths, also questioned the link between Vodou and the two cases. "Vodou never, ever sanctions stabbing or any kind of child abuse," she said. "It seems nonsensical."